The Lydd defence and keeper had begun the game very uncertainly, and on 10 minutes more hesitation from the keeper nearly allowed Ramsamy in to finish, but a defender nicked the ball away from him. After the early onslaught, Lydd had their first chance on 12 minutes when a backpass from Agyemang was picked up inside his own box by Nic Taylor. Lydd were awarded an indirect free-kick inside the box and played it short but the resulting shot was blocked by the Fisher wall, then cleared by Hamill. 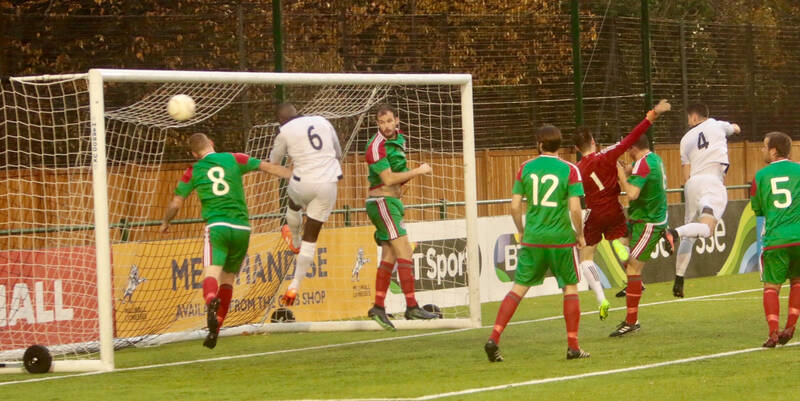 Babatunde then had two chances to extend Fisher’s lead. 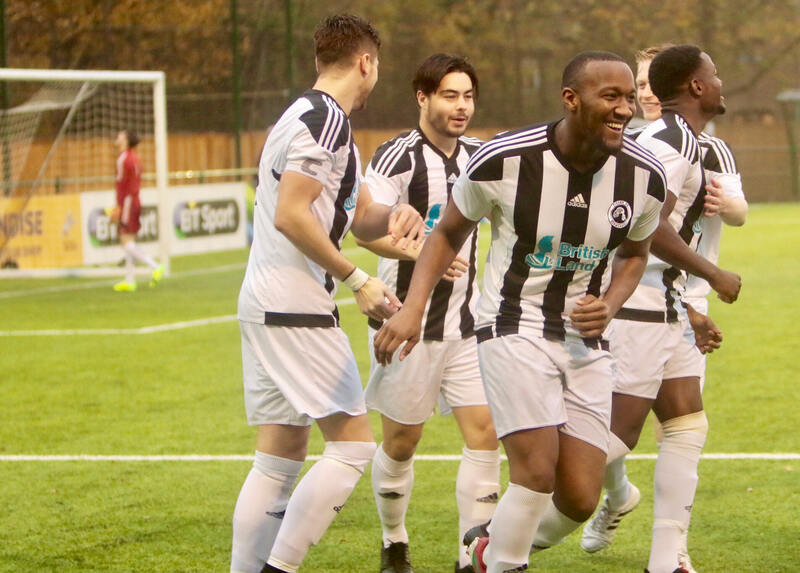 On 19 minutes, he was sent clean through on goal from the edge of the centre circle – Lydd’s three man defence played very high up the pitch throughout the game, and the offside trap was sprung on numerous occasions by Fisher. This time, the keeper came 30 yards out of his goal to clear at Babatunde’s feet. Just a minute later, Babatunde was sent clean through again. He flicked the ball over the keeper who had come rushing out again and tried to gather his own pass, but a defender got in to take the ball away from the big number 9. The ball broke to Ramsamy who tried to direct the ball into the empty net, but his shot went over. Dan Flemming nearly restored Fisher’s three goal lead a couple of minutes later, with an audacious attempt at an overhead kick after a Hamill free kick into the box had been headed up into the air. Sadly the ball flashed just wide. Fisher kept pushing for another goal, with Jamie Brown proving a thorn in the opposition’s side as ever. The winger broke into the box and crossed across the face of goal, but Babatunde couldn’t reach the ball. A minute later, he broke through again and another low cross was pushed clear by the keeper. This time Babatunde did gather the loose ball, turning his man and then shooting but the keeper recovered to gather at the second attempt. A minute before the break, Babatunde had another chance, this time seeing a fierce shot tipped over the bar after good work by Haidarovic down the right wing. Right on 45 minutes, Fisher had one final chance, Rob Brown bursting through into the box but the keeper got out to block at his feet before the bouncing ball was hoofed clear. Half time – Fisher FC 3-1 Lydd Town. A very well deserved lead for the home side, who really could have been further ahead. There had been some lovely possession football in a dominant first half, and the Fisher faithful were delighted with their side’s showing. Lydd ought to have pulled another back on 58 minutes, when a cross right across the face of goal was begging to be tapped home, but the number 10 took a fresh air swipe and missed the ball altogether. Just a minute later, Lydd came even closer when a thumping shot from 20 yards out thudded off the base of Nic Taylor’s right hand post and clear. The game then saw a fairly scrappy period, punctuated with a good chance for each side. First Fisher came close, Dwayne Agyemang hitting the bar with a header on 61 minutes after Ramsamy had bamboozled his man on the edge of the box and stood up a delightful cross to the back post. Then it was Lydd’s turn, a direct free kick on the edge of the box being tipped wide by a flying Nic Taylor on 68 minutes. That was the last time Lydd were to threaten, however: for the remaining 20 minutes it was all Fisher as the home side’s superior fitness told once again, just as it had the previous week at Thamesmead when down to 10 men. Hat-trick hero Babatunde was taken off to a standing ovation, having made a real impact in his first game at St Paul’s. His finishing was lethal, but his link up play and tireless running did not go un-noticed either by the Fisher faithful. He was replaced by Jack Bullock. It seemed as if the game was petering out, but that was without reckoning for Richie Hamill’s hunger and desire. On 84 minutes, the midfield maestro sent a wicked cross into the box, but there were no takers. Three minutes later, with his mates serenading him with a loud chorus of Happy Birthday (and some other unmentionable chants), he shot from inside the box but the keeper got down to block. The Fisher’s faithful’s thoughts had turned to the final game of last season and the thumping 10-1 victory over Erith Town. No-one present that day could believe they had seen double figures – could Fisher really repeat the feat so soon? Sadly for Fisher, the ref brought proceedings to an end very swiftly after the ninth goal, perhaps taking pity on Lydd Town by not insisting on much additional time. Full time: Fisher FC 9-1 Lydd Town. A wonderful attacking display by Fisher, who were well on top throughout but simply rampant in the final half hour. Great passing, great movement and some tremendous team goals, not to mention an inspired performance by Richie Hamill (even by his own high standards) and a debut hat-trick and assist for Toyeeb Babatunde. An unforgettable day for the 82 hardy souls who turned out in pretty miserable conditions! Sponsors’ man of the match: Saturday’s match was sponsored by Cocke Vellacott & Hill (http://www.cockevellacottandhill.co.uk/), an accountancy firm based just down the road on Surrey Quays Road. Our thanks again to them for their generosity, and we hope they enjoyed the day and will be back at St Paul’s again soon! They chose Toyeeb Babatunde as Saturday’s man of the match.